Howard Pulley is headed to Peach Jam once again, sporting one of the most experienced rotations in the EYBL. The Panthers return four players from last year's squad, featuring only two underclassmen in their rotation. One of those underclassmen is super-sophomore Amir Coffey, the 31st ranked player in the 2016 class by ESPN and widely considered to be "next" for Howard Pulley. Coming off a solid regular season in which he averaged 9.3 points, 4.4 rebounds, and 3.1 assists, Coffey will be greeted with an opportunity that few players get; the opportunity to compete at Peach Jam as a sophomore. D1's Alec Kinsky had a chance to sit down with Coffey, detailing his first year in the EYBL, Pulley's team chemistry and his thoughts on the upcoming Peach Jam. Alec Kinsky: Has your experience in the EYBL up to this point been everything you thought it would be? 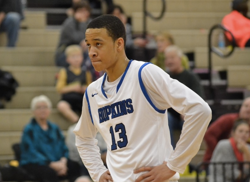 Amir Coffey: My experience in the EYBL has been great up to this point. Playing against high competition every game and top players in the country has been really fun. AK: What's the main difference between the EYBL and high school? AC: In high school, the games you play don't really matter until sections and state. In the EYBL, every single game you play counts. AK: What specific aspects of your game have you been looking to improve during the circuit? AC: I've been looking to improve every aspect of my game. Anything and everything I can improve, I want to do it. And the EYBL really helps with that because you're playing against the best players, so it really shows what you need to work on. AK: How is the preparation going heading into Peach Jam? You and your teammates keeping the chemistry up? AC: Definitely. We've had a couple of weeks off, but we are getting back on the court this week to put the final pieces together and make any adjustments needed. We will go into Peach Jam prepared and ready to compete. AK: Which of your teammates would you say has impressed you the most? Anyone stick out just a bit more than others? AC: I would say Sacar Anim. Dude just has a motor to him and plays every game with a chip on his shoulder. He impressed a lot of people this season, not only myself. AK: Any new schools come calling after the regular season? AC: There's been a couple of schools that had me on their radar, but is it mostly the same schools that I talked to during the high school season. AK: What excites you most about heading to North Augusta for the Peach Jam? AC: Just competing, and playing to win the whole thing. It's going to be a lot of fun and I'm ready. I'm excited for it.